A tumultuous previous week saw crude benchmarks sinking on fears of growing global supply, and a financial rout across the globe. US weekly output rose to 10.25 mmb/d last week, while Iran announced plans to increased crude production by 700,000 b/d through 2022. While OPEC expresses the opinion that US shale will not ‘materially affect' its efforts to rebalance the global crude supply, the market evidently believes otherwise, keep oil in the red all of last week. Trends were more neutral at the beginning of the week, with the US dollar retreating against most currencies after a strong week, making crude purchases more attractive pricing-wise. However, the EIA announced that American output was on track to reach 11 mmb/d ‘faster than expected', possibly by November 2018, ahead of its previous forecast of the level being reached in November 2019. Under the new US budget agreement, the US may have to sell an additional 100 million barrels of its emergency oil reserves to pay for its bills, which could reduce the national stockpile to 303 million barrels. 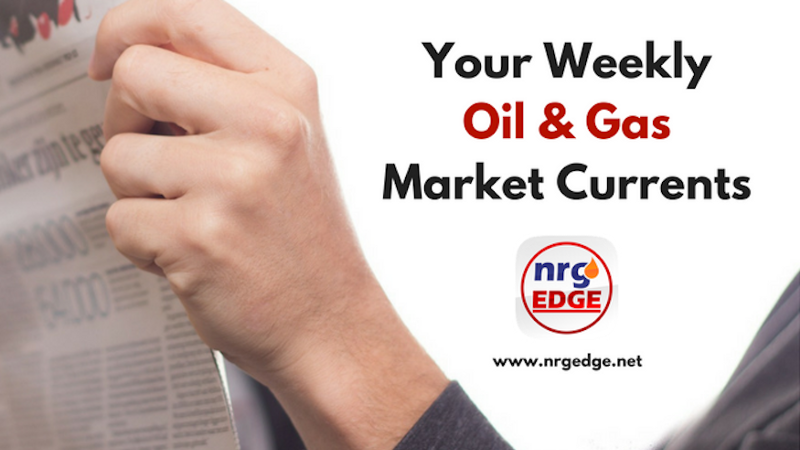 American crude stocks rose on growing production, with fuel product inventories also increasing as American refiners hiked utilisation rates. Active US oil and gas rigs swelled by a large 29 sites last week, 26 of which were oil rigs, bringing the total active rig count to 946. Crude price outlook: After last week's rout, crude prices will gain more normality this week as the weakening US dollar props things up. Brent should average around US$62-63b, while WTI will remain shy of the US$60/b mark. Lebanon has awarded its first two oil and gas E&P agreements to a consortium of Total, Eni and Novatek (out of five put on auction), which includes the contentious Block 9 with dispute issues with Israel. The state of California said that it will block transport of petroleum obtained from new offshore rigs that fall under President Trump's proposed plan to expand drilling across US federal waters. Qatar Petroleum has obtained a 25% stake in South Africa's Exploration Block 11B/12B in the offshore Outenique Basin. This reduces Total's stake to 45%, along with partners QP, CNR International and Main Street. The Forties pipeline in the UK North Sea has been shut again – the second time in two months – over a technical error, restarting a day later. ExxonMobil is fast-tracking its development plans in Guyana, now aiming to have the Payara field producing by 2023 and planning for a bigger FPSO to support Phase 2 of the Liza development. Surging demand saw China import 9.57 mmb/d of crude in January, a new record high, with natural gas imports also surging to 7.7 million tons. European refiners are reportedly unhappy with Russian crude purchases, as Moscow's close trade ties with China leaves volumes of lesser quality available for its western customers, particularly the flagship Ural grade. Petrobras has begun the process of selling its 110kb/d Pasadena refinery in Texas, only 12 years after acquiring a controlling stake from Astra Oil. Iraq has approved Ranya International's plan to build a 70 kb/d oil refinery near Kirkuk, as Baghdad seeks to assert itself in Kurdish areas. ExxonMobil's 1.5 mtpa ethane cracker at its Baytown refining complex has been completed, with commissioning now in progress. South African petchems producer Sasol has completed its US$1 billion expansion of the Sasolburg wax plant, increasing capacity to 137,000 tpa. Eni announced that it has made a ‘promising' gas discovery offshore Cyprus in the Calypso 1 well, describing it as ‘Zohr-like', referring to its giant gas discovery in Egypt as gas plays in the Eastern Med heat up. For Zohr, Eni now expects that production will reach some 2.9 bcf/d by mid-2019 from an estimated 1.8-2 bcf/d at end-2018 over seven trains. Cheniere has signed two LNG agreements with China's CNPC, delivering some 1.2 mtpa of LNG beginning 2018, with another tranche kicking in during 2023, lasting through 2043 indexed to Henry Hub prices. Thailand will be holding auctions for the Bongkot and Erawan gas fields next month, as Chevron and PTTEP's licences expire in 2022 and 2023. Chevron has sold its first condensate cargo from Wheatstone to Thailand's PTT, as the giant LNG project begins to ramp up output. Mozambique's government has approved Anadarko's US$20 billion plan to develop the Area 1 LNG project, with Anadarko announcing that it had already agreed price and volumes of 5.1 mtpa of earmarked gas output. Total and Papua New Guinea's state-owned Kumul Petroleum has signed an agreement to jointly market LNG and condensate from Papua LNG.